This has been a tough year for Actors Theatre. As explained in a message from Producing Artistic Director, Matthew Wiener, the theatre has been on ‘pause’ for several months. But now, after much restructuring and a certain amount of introspection and change, that pause is released and the play is the thing, and it couldn’t be more thrilling. 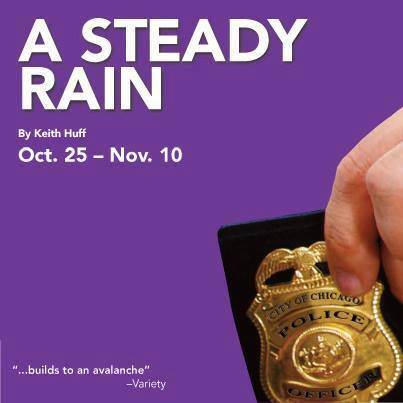 The play chosen to begin Actors Theatre’s unpause, as Matthew describes it, is A Steady Rain by Keith Huff, a gripping drama of two Chicago cops performed on a sparse stage with a set that requires nothing more than two chairs, a table, a jug of water and two cups. 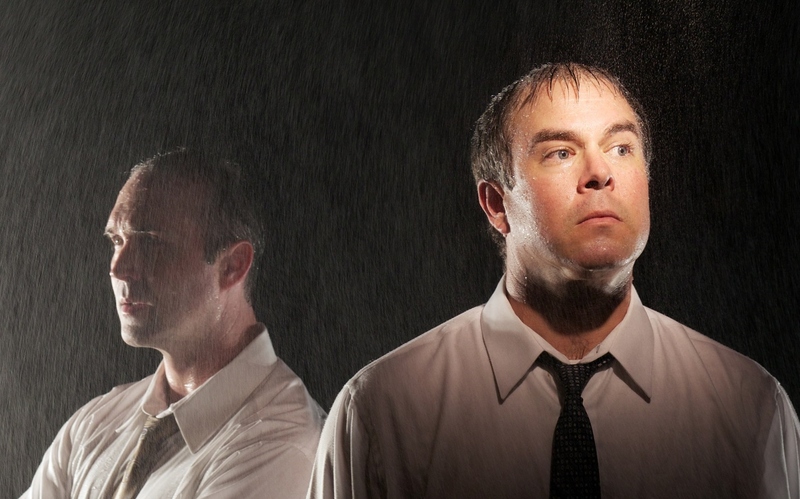 What makes this a practically perfect choice to illustrate what Actors Theatre is all about is the fact that A Steady Rain is, above all else, an actors play. Those who write might argue that because of its style – the production is a series of confessional monologues presented in a he said, he said manner – A Steady Rain is really a writers play, but in reality it needs actors of considerable skill to make those lengthy monologues spring to life. Both Joseph Kremer and Christopher Haines do exactly that, but in ways that you might not always expect. Director Anthony Runfola has fleshed out two strong performances from his duo. 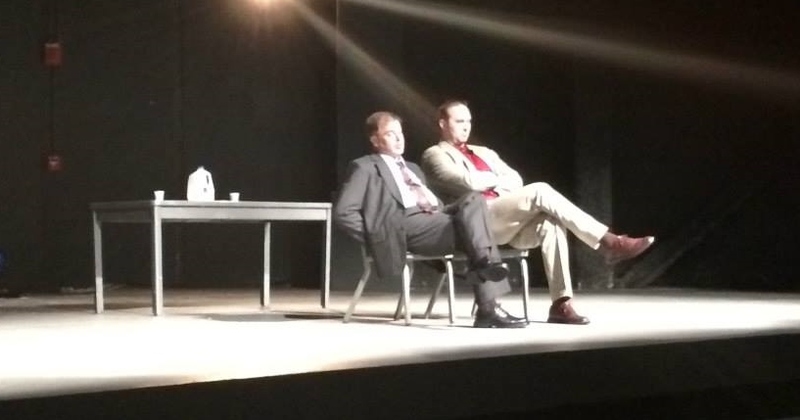 Both Kramer and Haines confide directly to the audience with such energy and passion that when they detail the events of their lives and the lives of those their actions affect – friends, family, working colleagues – you feel that by the end of this emotionally draining sequence of actions you have come to know a whole slew of characters in addition to the two players before you. 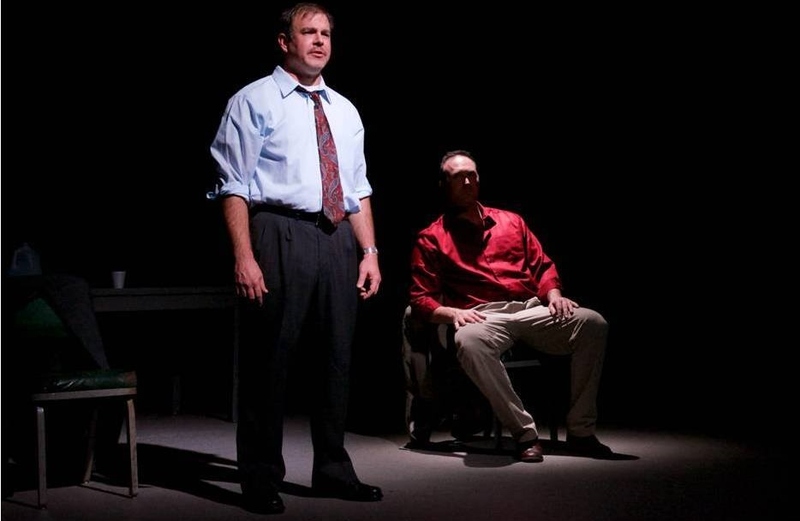 By the time the play concludes and the two actors take a bow you feel as though other important characters continually mentioned throughout will be joining them. The play runs for a taught ninety-five minutes or so, plus intermission, though in truth this is one play that arguably doesn’t require an intermission. If anything the break actually gets in the way. The lengthier first half acts more as an introduction to the lives and habits of the two buddy cops, long-time friends who support, protect and even lie for each other, while the second half reveals that one catastrophic event that changes the course of everything. Perhaps for some, the intermission is a moment of release, a welcomed break from the undeniable grip the play holds, but for others it’s just a roadblock. You want to know where the play is going, and you want to get there as soon as possible. However, the event that changes everything revolves around the disclosure that the two cops released a frightened Vietnamese boy back to the custody of a man claiming to be the boy’s uncle who turns out to be a cannibalistic serial killer. The “Rice-puppy kid,” as Denny describes him, is killed, and the two cops find themselves ensnared in an investigation where they are held responsible for their failure in correctly assessing the reality of a terrible situation. Everything we learn unfolds in clear, cinematic terms, but it’s the cinema of the mind; the ability of two accomplished actors creating the reality of events that continually ignites pictures in the psyche. They give flesh to events we think we’re witnessing, but it’s in our heads. That’s the power of a mostly bare stage, stark lighting and great live theatre. And that’s the power of Actors Theatre. For more information regarding times, dates and tickets, CLICK HERE for Actors Theatre website.